The utmost in strength and integrity. -Heavy Duty Die Cast Locks: Securely attached to both vinyl sash and reinforcement. -Deeply Pocketed Head: With weather stripping to resist air infiltration. -Optional Dual Tech Lock and Keeper: Cam action actually draws sash closer together for positive lock. -Innergy Rigid Thermal Reinforcement: Innovative, superior, energy-efficient alternative to aluminum reinforcement. -Equal Lite Sashes: Same size glass on both sashes creates look of wood. -Positive Sloped Sill: Provides water runoff even in driving rain. -Fiberglass Insulation: In frame and sash for maximum energy saving and efficiency. -Two Layers of Weather Stripping: Each with double mylar fins for water infiltration. -3/4 Insulating Glass: Standard LowE glass, using a high tech coating specifically chosen for maximum regional thermal efficiency. -Stainless Steel Constant Force Balance: Trouble free, maintenance free. Provides smooth operation. -Interlocking Meeting Rail: Integral interlock provides additional security. -Dual Tilt in Sashes: Both sashes tilt in for easy cleaning. -Double Night Vent Latches: Allow for ventilation with securtiy. 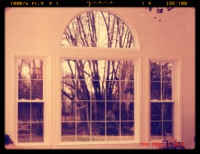 -Vnyl windows are bulit to last and will never chip, rot, peel, or rust. -Virgin Vinyl never needs painting. Color goes all the way through. -Energy Star Certified by the DOE & EPA for the entire United States. Our windows can be 88% more energy efficient than clear glass and reduce UV rays by up to 94%. -Our Energy Star Certified product can reduce heating and cooling costs. -Fulled Welded Double Wall Interior Dam Leg: With fin-seal weather-stripping for improved strengh and optimal air and water performance. The 144 Series Window System represents state of the art design in window systems, among the most advanced in the industry. We offer styles and options to fit any architetural requirements-both contemporary and classic. We build to a quality level achieved from years of experience and back it with our Lifetime Limited Warranty. 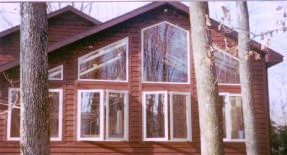 Each window is custom made to fit specific window openings and decors. Contour Beveled Exterior. Half screens are standard; full screens also available. Pro-Tech 177 Setting the standard in Windows. State of the art technology. More than thirty years of research and development are built into every fully welded Pro-Tech 177 Series replacement window, producing state of the art designs using advanced production techniques. A technologically advanced fabrication process allows compound shapes to be fusion welded at sil corners, producing a window that is actually stronger than conventional welded windows. Innovative technology means unparalleded styling and top performance for homes of distinction. Insulating glass maintains comfort, saves energy, and reduces outside noise. Pro-Tech 177 & Earthwise 143 Series Window Systems insulating glass is made with the following high quality elements. Classic beauty and effortless operation makes this one of a kind casement window system. A beveled frame, slim lines, and maximum glass exposure combine to create a sleek apperance. Advanced window technology gives the design many operational advantages. 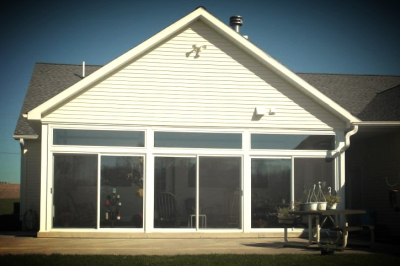 The welded awning combined with the picture window produces a sophisticated, uncluttered look with a great view. Enjoy contemporary styling and brin more natural light into your home with our classic bay or bow window. Distinctive, yet highly pratical, these windows brighten interiors dramatically. Our bays and bows are fully customizable to match your home decor. Choose from a width range of 49" to 144"; any of our stylish grid options or none at all; 10 degree, 30 degree, or 45 degree bay windows; four or five lite bow windows. Center and end vents are available in picture window, double hung or casement in the combination of your choosing. Jamb widths are also customizable to suit your every need. Create light and inspirational views in your living space with our premium patio door. This rigid vinyl door is an inviting transition from room to room. This beautifully engineered system is designed with all the performance features important to you. Weather-tight frames combined with the natural insulating qualities of vinyl greatly reduce heat and cold transfer providing year-round comfort. Made from high quality, energy-efficient, virtually maintenance free vinyl, these doors ensure satisfaction and lasting performance. Choose from a variety of stlyles that will add beauty to your home. Add side lights, custom transoms and decorative grids to express your unique tast and your homes' architectural style.